Delve into Jive Bunny's bag of tricks and have some fun with these light hearted games and apps! Is your music knowledge up to scratch? 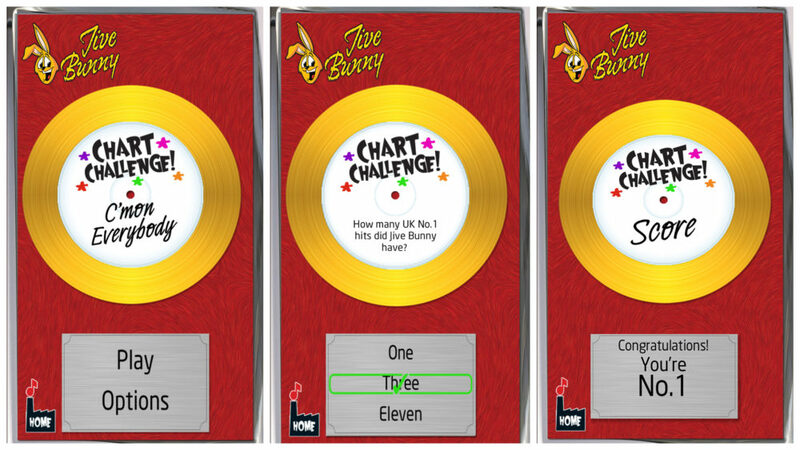 Test yourself with Jive Bunny's Chart Challenge! It will take you through decades of musical history, testing your trivia from rock and pop, ABBA to ZZ Top. Pit your wits against the mighty bunny and see if you can hit the top spot but be careful or you might just fall out of the charts. Happy Birthday in the style of Jive Bunny! Do you know a fan who'd love a personalised greeting in the unique Jive Bunny style? Check out the Happy Birthday YouTube Channel where you can find a playlist containing loads of names, and if you can't find the one you're looking for, hop over to their Facebook Page and request the name you'd like to hear!